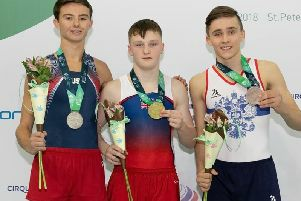 There were medals aplenty for Arabian Gymnastics as they took on competitors from all over the UK at the Witham Hill classic Invitation. Starting off on the Saturday were Naomi and Ruby Matheron and it was Naomi in the 8 to 9 year age who won fourth placed medal on trampette and older sister (10) Ruby that won bronze on trampette. Holly Dennis in the 11 year group won 2nd on floor and 3rd on bar. In the 12 plus age group, Lara Moffatt won 2nd on Vault and 3rd on bars. Emma Penny was 5th on bars just missing out the medals. Daniella Pritchard was 4th on bars, Bethan Retford won two medals with bronze on vault and silver on trampette. Sarah Jane T Donnell wrapped up the afternoon with three medals with 2nd on bars and 3rd on tumble and trampette. Six-year-old Lucy Walsh stole the show gold on bars and impressed with 5th on beam and 7th on trampette. Eva Baily, competing for the first time, came 11th-12th across the board. Emilia Agafona really did show her progress with a gold on bars and 2nd place on beam. Naomi Fedoriw, 10, won two golds on vaule and bars, silver on tumble and was 4th on the beam. Ruby Raynor (9) had a cracking beam routine nailed and won gold. Bella Campbell-Marshall (9) took gold on trampette and 5th on vault. Emilee Brooks (10) took gold for vault and silver on trampette. Sophie Fretwell’s incredible medal streak, which is now nearly two-and-a-half years long, pulled off her remarkable vaulting somersault which won her gold. She also won on the beam and came 4th on the beam. The final medals of the night went to Coach/gymnast Hannah Bond, 19, who won gold on the high beam and silver for her remarkable floor display.